A Christmas window is a special window display prepared for the Christmas shopping season at department stores and other retailers. 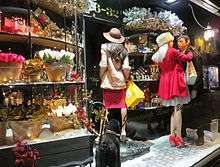 Retailers around the world become particularly famous for their Christmas window displays and they often become tourist attractions. Christmas windows are usually thematic and can include animatronics. AM&A's flagship department store in Buffalo, New York was known locally for its Victorian Christmas windows. Auction internet company Chartitybuzz auctioned the experience of watching Simon Doonan create the Barney's Christmas windows to benefit Christie's Green Auction in 2010 with a final bid received for $60,000. Kaufmann's offered Christmas windows and Santa Land. 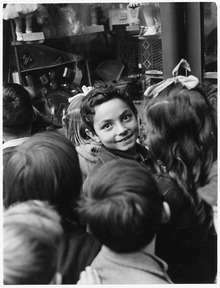 Fees were charged to see Lonnie Hanzon's Christmas window display 12/25: A Holiday Store in Omaha in 1987. Until it closed in 1989, Altman's was known for its Christmas window displays that rivaled Lord & Taylor's, a few blocks up on Fifth Avenue. In Pittsburg, Horne's was one of the retailers known for its Christmas window displays. In Boston, Filene's would hold a Christmas tree lighting and Jordan Marsh would present a series festive Christmas window displays known as the "Enchanted Village". The window display has since relocated to Boston's Hynes Convention Center, and then to City Hall Plaza. 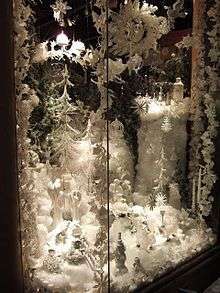 In Montreal, James Aird Nesbitt was in charge of the traditional Christmas window displays at Ogilvy (department store). In 1947, he commissioned German toymaker Steiff to create two animated holiday scenes known as "The Mill in the Forest" and "The Enchanted Village". The displays included dozens of handcrafted mechanical toy animals and more than a hundred moveable parts. 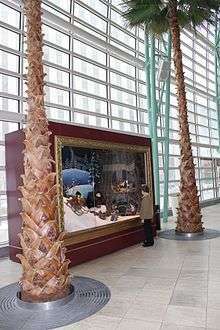 In 2008, the displays were completely refurbished. Woodward's Department Store in Vancouver's retail shopping district was famous for its Christmas window displays. Tom Keogh designed the annual Christmas windows for Galeries Lafayette department store in Paris during the late 1940s and early 1950s. The Fenwick (department store) in Newcastle is famous locally for its Christmas window display. Since 1971 there has been a Christmas display in the shop's windows, and people come from near and far to look at them. There are records however going back to the 1930s to indicate that displays have been done. This 2009 theme was a traditional nativity scene, very different from the 2002 aliens theme (Christmas in Another World) which showed aliens celebrating Christmas and sparked lively discussion in the letters page of the local papers. The Arab dress provoked some debate. The commentators may not have been familiar with the location of Bethlehem. In 2011, the store held the 40th anniversary of the store's Christmas window display tradition. The store is most famous for its extravagant windows, filled with detailed sets and sophisticated moving figures, which appears every Christmas and almost rivals the windows in Liberty's. The themes are taken mainly from fairy tales and children's stories. The figures move and are accompanied by music. In 2011, Anthony Ausgang designed the Christmas windows for the La Rinascente Department Store in Milan with larger-than-life three-dimensional models of his trademark psychedelic cartoon cats. Bertrand Planes designed Christmas window displays for Le Bon Marché in Paris. 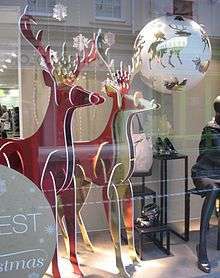 In Australia, the Sydney department store David Jones presents an annual animated Christmas Window display. Traditionally these have often featured snowy northern hemisphere Christmas scenarios, but in 2014 the windows are set in a distinctly Australian summer, featuring beach and rainforest scenes, based on the book "Reindeer's Christmas Surprise" by Australian author Ursula Dubosarsky and illustrator Sue De Gennaro. In Melbourne, the Myer department store began presenting an annual Christmas window display in 1956, and later added the annual Myer Christmas Parade. Displays have typically included scenes from Christmas related stories such as The 12 Days of Christmas, A Christmas Carol and How The Grinch Stole Christmas as well as nativity scenes and scenes from children's stories and fairy tales. For the past few decades, displays have featured animated characters. Uno's Garden was chosen as the theme of the 2007 Myer Christmas Windows in Melbourne and Brisbane, Australia. The films Miracle on 34th Street and A Christmas Story feature Christmas window displays. 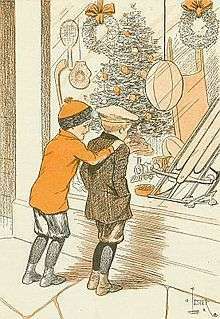 The book cover from the children's novel Christmas Holidays at Merryvale by Alice Hale Burnett (1916) featured a couple of children peering in a Christmas window. ↑ "New Yorkers & Company, Where Christmas is Already Over"
1 2 "Jay-Z Tops List of Super Celebrity Fundraisers of 2010". Tonic. Retrieved December 27, 2010. ↑ "Christmas Store Charges a $1 Admission Fee". Los Angeles Times. 25 November 1987. ↑ "Ogilvy's peek at the Christmas season". Gazette, Montreal. November 19, 2011. ↑ Butcher, Joanne (2 November 2011). 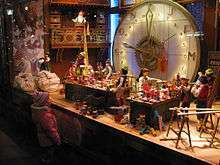 "Kids flock to Fenwick Christmas window display". The Evening Chronicle. Retrieved 29 April 2012. ↑ "Paris Christmas Windows go futuristic with Lanvin and Le Bon Marche". Focus on Style. Archived from the original on 26 November 2012. Retrieved 18 October 2012.